The POV Mount Kit from V.I.O. provides you with a variety of ways to attach your POV image head to just about anything. Whether you need to replace a piece, or just want to have mounts ready to go on the equipment you use most, the POV Mount Kit has you covered. The main features of the kit include the Camera Clamp and the Cable Guide. The Camera Clamp keeps the image head secure while allowing precise angles to be achieved for capturing professional quality footage. The Cable Guide keeps the cable under control when the image head is mounted. All told, the kit comes with 3 Camera Clamps, 1 Goggle Mount, 1 Pipe Mount, 1 Tripod Plate, 1 Star Mount, 1 Mini Rail, and 4 Cable Guides. Box Dimensions (LxWxH) 8.0 x 7.9 x 2.2"
POV Mount Kit is rated 4.2 out of 5 by 6. Rated 3 out of 5 by Schoolie from Lots of options This product is great if you are the sole user of the camera - you will not be disappointed. What it doesn't allow enough of is interchangeability. The permanent sticker system for many of the mounts doesn't help when swapping from helmet to helmet. It has a magnet system, which is fine, but magnets don't stick to plastic helmets! Probably don't need the kit if you only have 2 or 3 uses, the standard mounts that come with the camera will cover that. Expensive for what it is. Bottom line - would recommend if you have lots of need for different mounts. Wouldn't recommend if only 2-3. Rated 5 out of 5 by Charles L. from Just about all you need. This kit contains about everything you need for mounting a VIO-POI camera. Quality is good. I intend to use helmet mount, both ski and bike, as well as tripod. The only thing they could have added would be an adjustable clamp to attach to things like table edge or seat backs. These are available, however. Rated 4 out of 5 by raudi1 from Everything you need... 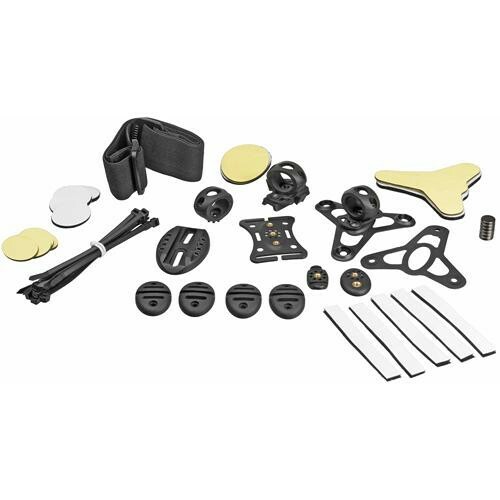 This Kit includes a variety of different mounting options that let you use your VIO POV on different helmets (bike and Ski) and also attached to your handlebars. it is a very worthwhile accessory to the Camera. Rated 4 out of 5 by OG from I would purchase this again. the product gives various ways to mount the camera lens to helmets, bikes and other items. the mounting items that came with the camera are limited and the kit fills in the other areas. Rated 4 out of 5 by Irineu Minato from I recommend, it is a great accessory kit It is very useful for use in helmet.